On 01.11.2018, an environmental zone is introduced in the centre of Madrid, which will be then converted into a zero emission zone (ZEZ) in the medium term until 2025. After a short trial period of two months, from 01.02.2019 a fine of 90 euros will incur in case of infringements in the ZEZ, which is also called ACCE (Area Central Cero Emissions) in Madrid. 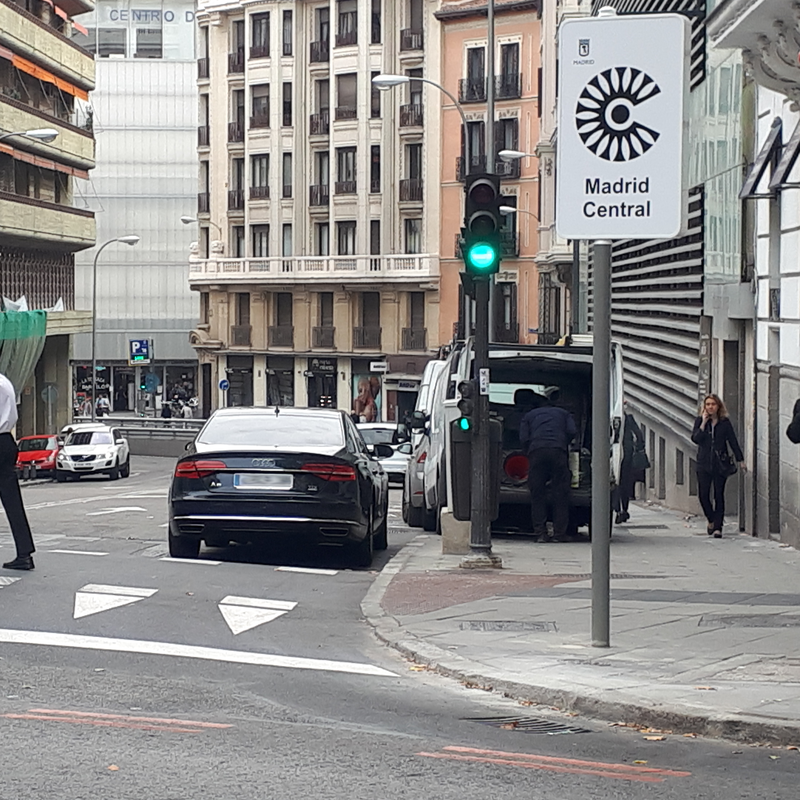 This zone was established by the City Council of Madrid, which had set rules for sustainable mobility in an ordinance and approved them in September. On 21.09.2018, the so-called Plan A was presented to the public by the Major of Madrid, Manuela Carmena. The objective of the zone is to allow only low or no emission vehicles to enter. This means that only hydrogen and electric vehicles as well as plug-in hybrids with a range of more than 40 km are permitted to enter the zone. In addition, natural gas and hybrid vehicles are also permitted to enter if, according to the registration date and the EURO class, they meet the criteria of the C badge class, as shown on the classification table. Vehicles without the Distintivo Ambiental badge cannot enter the zone, vehicles with B and C badge classes cannot access the zone, only parking in the zone is allowed. Motorcycles with B and C badge classes are not allowed to enter between 10 pm and 7 am. Motorcycles with 0 and ECO badge classes can enter at any time. 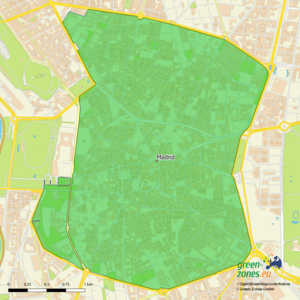 The ZEZ Madrid/Central environmental zone covers an area of 472 hectars (approx. 1.6 km x 3 km) and is recognisable by a 10 km long red line, which has been painted on the road and marks the borders of the zero emission zone. In addition, large white and green signs have been placed on over 60 intersecting roads throughout the city and corresponding symbols have been painted on the roadway. The ZEZ inner city area is the district no. 1 with its 6 districts Palacio, Universidad, Justicia, Sol, Cortes and Embajadores. All ZEZ areas consist of SER (Servicio de Estacionamiento Regulado) regulated parking zones and are located in the SER Verde (green) zone, where you can park for up to 2 hours paying more than 8 euros. Electric, hydrogen and hybrid vehicles with 0 and ECO badge classes can nevertheless park without restriction and free of charge, unless prohibited by a general or specific rule. 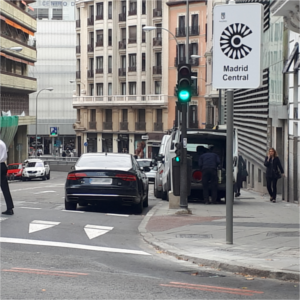 Access and parking rules in the ZEZ Madrid/Central do not apply to vehicles of disabled people. The ZEZ Madrid/Central is located within the LEZ Madrid/M-30 environmental zone, which is a much larger temporary environmental zone that, in turn, lies within the LEZ Madrid/City. From 2025, residents will also be affected by driving bans. The Madrid/Central area comprises the 6 districts of Palacio, Universidad, Justicia, Sol, Cortes and Embajadores and covers 472 hectares.The access to the ZEZ is restricted, except for the roads of Santa Cruz de Marcenado, Mártires de Alcalá, Gran Vía de San Francisco, Bailén, Algeciras, Cuesta Ramón, Ventura Rodríguez and Duque de Liria.The reason for these exceptions is that there are no alternative routes. The ZEZ Madrid/Central can be recognized by the 10 km long double red line and the 57 symbols that have been painted on the asphalt, as well as by the large white and green signs that have been placed on over 60 intersecting roads. A special feature of the Madrid/Central zero emission zone are the traffic restrictions that apply to the parking area of the entire zone. 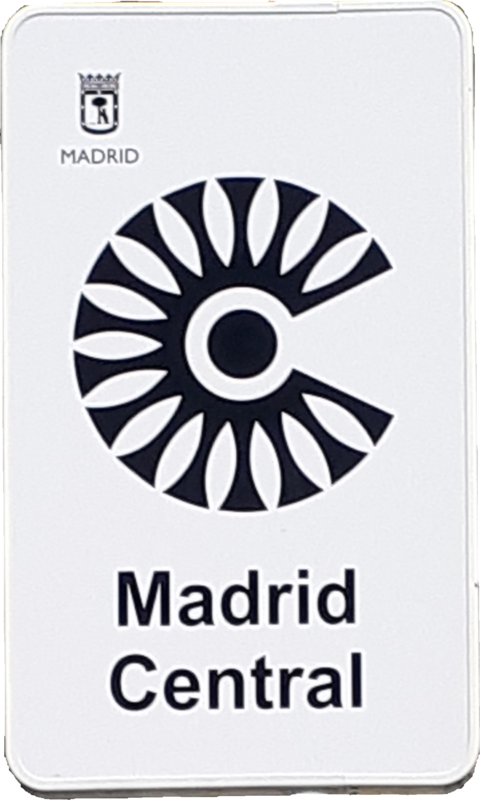 Since vehicles without Distintivo Ambiental are not allowed to enter and vehicles with 0 and ECO badge classes park for free, vehicles with C and B badge classes are also subject to a special rule. Any resident whose vehicle is equipped with a C or B badge class can park there after having registered in advance. Registered residents can also receive guests, visitors and suppliers up to 20 times a month after prior invitation, provided that their vehicles have at least a B or C badge class. This invitation is issued via an official city portal and requires written confirmation. Vehicles of invited guests without a C or B badge class are still allowed to enter and park for a transitional period until 31.12.2019. Residents can park their vehicles without a Distintivo Ambiental in the parking areas provided until the end of 2020.